The Commander is the Chief Executive Officer of the Post and shall supervise, lead and manage the Post and its Officers. The Commander shall preside at all Board Meetings, General Meetings, Special General Meetings and Special Board Meetings; nominate Standing Committees and Temporary Committees and their Chair, perform the duties necessary to keep the Post operating in an effective an efficient manner; have such other powers and duties as may be prescribed by the Board, Bylaws or as promulgated by The American Legion; and preserve the integrity of the Post Charter. First Vice-Commander is the Chair of the Membership Committee, and shall assume and discharge the duties of the office of Commander in the absence or disability of the Commander. Second Vice-Commander is the Chair of the Ways and Means Committee, assist with Veterans Affairs and Rehabilitation, public affairs and community outreach as directed by the Commander and shall assume and discharge the duties of the office of First Vice-Commander or Commander in the absence of disability o such officers. Third Vice-Commander is the Chair of the Americanism Committee, and shall assume and discharge the duties of the office of Second Vice-Commander, First Vice-Commander or Commander, in the absence of disability o such officers. The Finance Officer shall be the Chair of the Finance Committee, and responsible for overseeing the financial records of the Post. The Post Historian shall compile and preserve a pictorial Post history for print and electronic distribution. The Sergeant-at-Arms shall preserve order at all meetings and shall perform such others duties as may be from time to time assigned to him by the Commander. The Chaplain shall be charged with the spiritual welfare of Post members and will offer divine but non-sectarian service in the event of dedications, funerals, public functions, etc., and adhere to such ceremonial rituals as are recommended by the National or Department Headquarters. The Jr. Past Commander shall assist in the transition to a new Board and be available to advise the Commander upon request. These elected officers may serve on multiple committees of the discretion of the Commander. 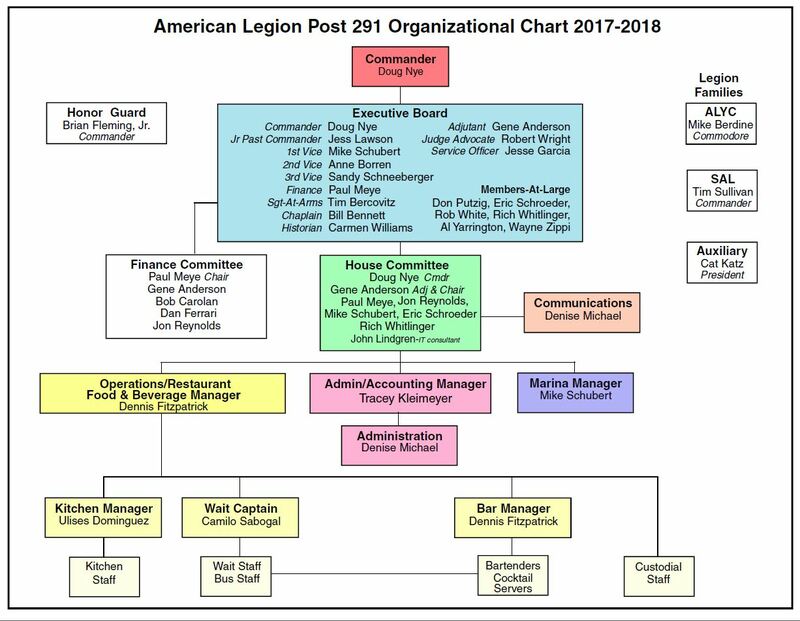 The Post Executive Board is a group of eighteen officers (fourteen newly elected, the previously elected Jr. Past Commander, and three appointed) headed by the Commander who is the highest-ranking officer. Post 291 Constitution, Bylaws, Rules, Regulations, and Policies. The Adjutant is the Secretary of the Board. Under the direction of the Commander, the Adjutant shall receive and answer all correspondence of the Post; have charge of an keep a complete and correct record of the proceedings of all Official Meetings; and prepare summarized meeting minutes an reports for publication. The Judge Advocate’s duties shall be to advice the Post Commander of the interpretation or modification of the Post’s Constitution, Bylaws, and Rules and Regulations, and be responsible for an annual financial audit and the Post Responsibility Audit as described in the American Legion Officer’s Guide. The Service Officer duties shall be generally that of: coordination all Post 291 veterans assistance programs; assist in processing veterans claims; and protecting the rights and privileges of all veterans, their dependents and survivors. Post 291 Honor Guard is organized to assist our regular uniformed military men and women in rendering military honor at memorial services for our fellow veterans. The squad also performs at various functions such as Memorial Day, Veterans Day, Flag Day, and special occasions. There are approximately 25 members in the squad, but new members are always welcome and much needed. Anyone interested in joining the ranks should be willing to give a small amount of their personal time to training and taking part in the various ceremonies. Practice is normally held the last Wednesday of the month at 6 pm. If you would like to become a part of this group don’t hesitate to call the front office and they can direct you in the right direction.